To celebrate the opening of That Day We Sang, Victoria Wood’s new production for the Manchester International Festival, an exhibition based on the Walter and Ida Carroll papers held in the RNCM Archives will take place at the RNCM during July and August. The Carroll collection was used during the research for the musical. 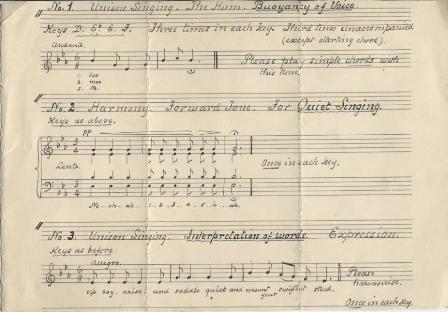 The exhibition pieces together the story of Manchester Elementary Schools’ Choir and its collaboration with the Hallé Orchestra in 1929, by looking at Walter Carroll’s contribution to the musical life of Manchester. Carroll is best known as a composer of piano music for children. He held several teaching posts at the University of Manchester and the Royal Manchester College of Music, before becoming Music Adviser for the City of Manchester Education Committee. Until his retirement in 1934, he devoted his career to the reform of music teaching in Manchester schools. One of Carroll’s achievements was to create a successful school children’s choir, which famously performed with the Hallé Orchestra at the Free Trade Hall on 4 March 1929. Taking this event as her inspiration, Victoria Wood's new musical tells two stories: that of the children of 1929, eagerly gearing up for their big day, and moving forward to 1969, that of Tubby and Enid, who, now somewhat older, are trying to reconnect with who they were then, and who they could be now. That Day We Sang will feature a new Manchester Children’s Choir formed especially for the occasion, and the Hallé Youth Orchestra. It runs from 6 to 17 July at the Opera House in Manchester. For tickets visit http://www.mif.co.uk/.